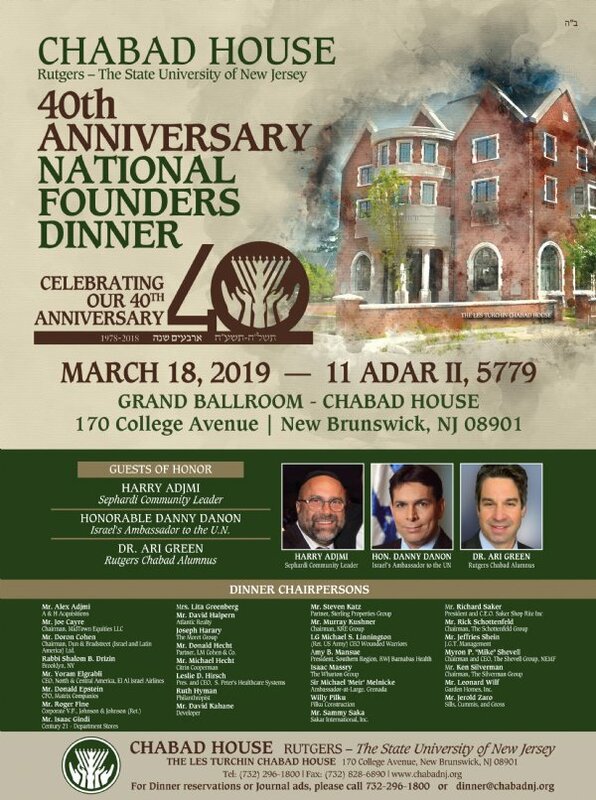 In a spirit of rejoicing and celebration, Chabad House Jewish Student Center at Rutgers University and its ten affiliate Chabad Houses serving central and southern New Jersey, will celebrate their National Founders 40th Anniversary Dinner at the Grand Ballroom of Chabad House, 170 College Avenue, New Brunswick, NJ, on Monday, March 18, 2019 at 6:00 PM. More than 600 community leaders and supporters are expected to pay tribute to the honorees, Mr. Harry Adjmi, Sephardi Community Leader, Hon. Danny Danon, Israel’s Ambassador to the UN, and Dr. Ari Green, Rutgers Chabad Alumnus. This gala dinner is celebrating the 40th Anniversary of Chabad House at Rutgers and the sixth year of operation of the 90,000 square foot mega Chabad House. This complex features Housing Suites for 107 men and women, a Sephardic Synagogue, Ashkenazi Synagogue, Judaica Library, International Coffee Shoppe, student lounges, computer areas, and a 750 person Kosher Dining Hall with enlarged Kitchens. Chabad House serves a population of seven thousand Jewish students at Rutgers University - the largest Jewish student body in the USA. In addition, this year's Gala Event will focus on the "untold story', of how Chabad Rabbis have worked closely with a number of local medical institutions to provide “Bikur Cholim” suites for families in need. Over the past decades, many hundreds of lives have been improved, due to this close working relationship that is not commonly known. Mr. Alex Adjmi, A & H Acquisitions; Mr. Joe Cayre, Chairman, MidTown Equities, Inc.; Mr. Doron Cohen, Chairman Dun & Bradstreet (Israel and Latin America) Ltd.: Rabbi Shalom B. Drizin, Brooklyn, NY; Mr. Yoram Elgrabli, CEO, North & Central America, El Al Israel Airlines; Mr. Donald Epstein, CFO, Matrix Companies; Mr. Roger Fine, Corporate V.P., Johnson & Johnson (Ret. ); Mr. Isaac Gindi, Century 21 – Department Stores; Mrs. Lita Greenberg; Mr. David Halpern, Atlantic Realty; Mr. Joseph Harary, The Moret Group; Mr. Donald Hecht, Partner, LM Cohen & Co.; Mr. Michael Hecht, Citrin Cooperman; Mr. Leslie D. Hirsch, Pres. and CEO, St. Peter’s Healthcare Systems; Mrs. Ruth Hyman, Philanthropist; Mr. David Kahane, Developer; Mr. Steven Katz, Partner, Sterling Properties Group; Mr. Murray Kushner, Chairman, KRE Group; LG Michael S. Linnington, (Ret. US Army) CEO Wounded Soldier; Ms. Amy Mansue, President, Southern Region, RWJ Barnabas Health; Mr. Isaac Massry, The Wharton Group; Sir Michael 'Meir' Melnicke, Ambassador-at-Large, Grenada; Mr. Willy Pilku, Pilku Construction; Mr. Sammy Saka, Sakar International, Inc.; Mr. Richard Saker, President & CEO, Saker ShopRite, Inc.; Mr. Rick Schottenfeld, Chairman, The Schottenfeld Group; Mr. Jeffries Shein, J.G.T. Management; Mr. Myron P. "Mike" Shevell, Chairman and CEO, The Shevell Group, NEMF; Mr. Ken Silverman, Chairman, The Silverman Group; Mr. Leonard Wilf, Garden Homes, Inc.; Mr. Jerold Zaro, Esq., Sills, Cummis, and Gross. Rabbi Yosef Carlebach, Director of Chabad House, will report on the new complex and its outreach programs and activities this past year. Participants at the dinner will receive a special coffee table "40th Anniversary Album" pictorially depicting the history of Chabad House from its first days in 1978, in a rented room at the Rutgers Student Center, to its location today as the largest Jewish Center on any public university campus in the world.